If you’re like me, when you hear the word “shrub” you immediately think of a small to medium sized plant used to give some visual appeal to your front yard. 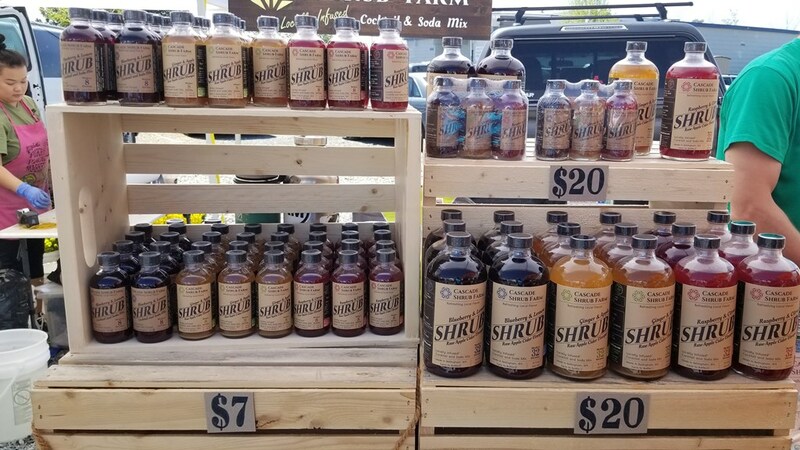 But I recently learned of another definition for shrub and you can get it from Cascade Shrub Farm, who is making their Everett Farmers Market debut this season. Josh Kramer and his partner Tomo met while studying massage on the island of Maui when they started Maui Shrub Farm. 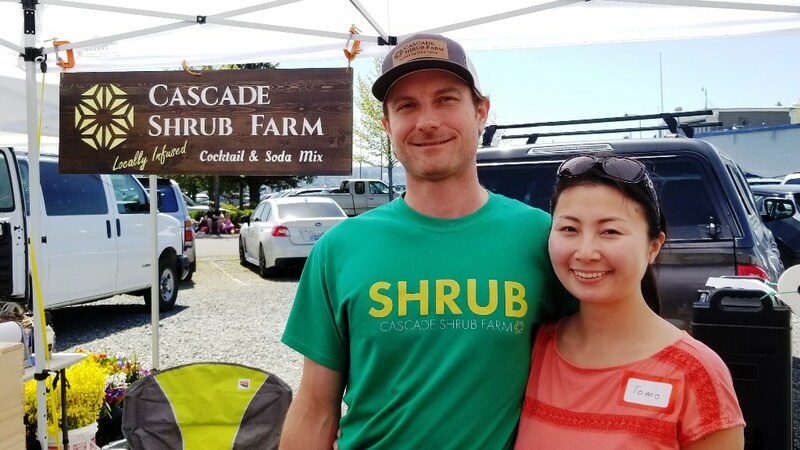 Inspired by their Northwest roots they began Cascade Shrub Farms based in Bellingham, WA in 2017. Wanting to learn more about shrub, I asked Josh a few questions. Shrub is a colonial-era drink whose name is derived from the Arabic word sharab, to drink. It is concentrated syrup made from fruit, vinegar, and sugar that is traditionally mixed with water to create a refreshing drink that is simultaneously tart and sweet. In the nineteenth-century, the drink was often spiked with brandy or rum. Using the word “shrub” to describe the vinegar preserve we know today started around the mid 1800s. Are there any health benefits associated with shrub? Yes. Raw organic apple cider vinegar aids digestions, provides antioxidants and strengthens the immune system. What motivated you to get into this business? While visiting family in Japan, a light bulb went off as Tomo and I were enjoying her mother’s blueberry vinegar drink. The sweetness of the blueberries and honey combined with the sour notes from the vinegar had such a refreshing balance. 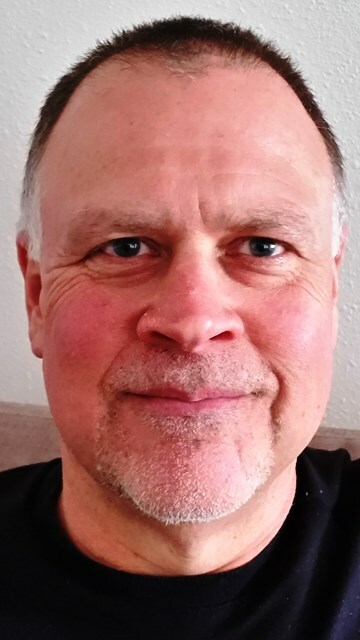 Being foodies at heart and always experimenting with diverse cultural flavors and cuisines, my husband Josh and I began to explore shrub vinegar preserves. Our ingredients are sourced as locally as possible. Our raw organic apple cider vinegar is made with Washington state apples from Eastern Washington. Our blueberries and raspberries are from a combination of small farms in Whatcom and Skagit Counties. We work with: Rabbit Field Farm in Mt. Vernon, Sunseed Farms in Acme, Spring Frog Farms in Everson, and Bow Hill Blueberries in Bow. What are some of the products that you’ll have available at Everett Farmers Market? At the Farmers Market we will offer our three Cascade Shrub flavors, Ginger & Apple, Blueberry & Lemon and Raspberry & Citrus. They come in either 16-oz or 4-oz sizes. We also have a 3-pack of our 4-oz bottles. I have to ask: what is your personal favorite shrub drink? Thanks, Josh. You can bet I’ll be at the Market on a hot summer day looking for some shrub to put in the beverage chiller.